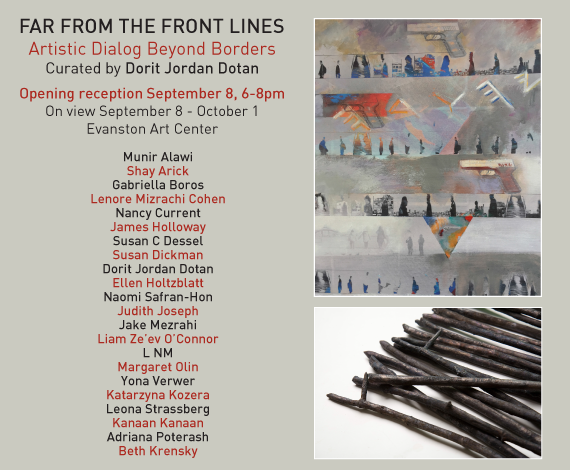 This exhibition, curated by Dorit Jordan Dotan, presents Jewish Art Salon’s artists: Gabriella Boros, Lenore Mizrachi Cohen, Nancy Current, Susan C Dessel, Ellen Holtzblatt, Judith Joseph, Yona Verwer, Katarzyna Kozera and Beth Krensky. It brings together a community of artists who strongly feel that art is personal, that the personal is political, and the political is very personal. The twenty-two North American contemporary artists selected for this exhibition were among those who responded to the call to create art about the Israeli-Palestinian conflict. As in many mediums, perspective derives from distance; being far away opens up a natural space for new viewpoints. Artists who are Far From the Front Lines have created an opportunity for artful dialog beyond borders. It allows both the audience and the artists themselves to actively promote meaningful change in our minds, where all borders ultimately reside. The exhibition catalog can be ordered here.